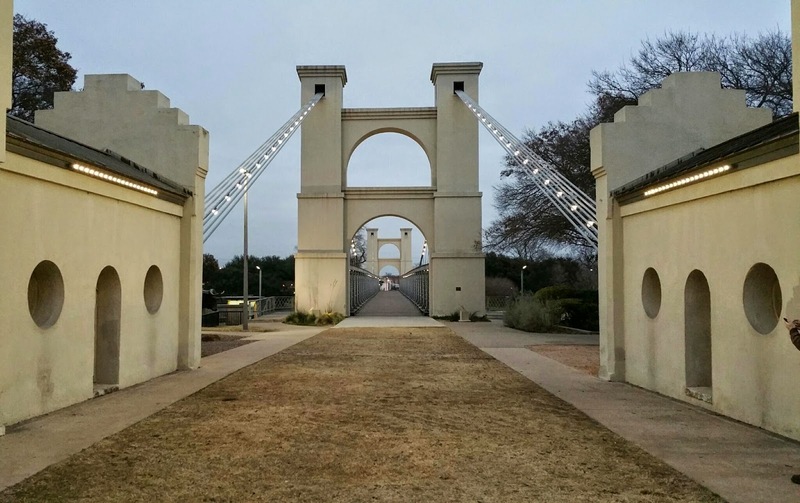 In 1870, the Waco Suspension Bridge opened for business. Although prior to that a ferry had existed for local travelers and passing stagecoaches, cattle drivers had to herd their livestock across the Brazos River. Depending on the season, recent rainfall, and the general fettle of the herd, a completely safe and successful crossing was rare. When the Civil War ended, Texas was as broke and hungry for commerce as any of the Confederate states. Her largest resource was the innumerable Longhorns that had been left to graze and fatten and procreate whilst the menfolk went off and got all up in some Yankee's grill. But getting them to the beef hungry markets to the East was a problem. Railroads were in their infancy in Texas then, with only 470 miles of rail in use by the early 1860s, the majority of it in and around Galveston. It was 1873 before Texas was connected to the nationwide rail system. In addition, a tick-borne pathogen to which Longhorns had a natural immunity was wiping out local herds of cattle in Kansas, Missouri, and Illinois. A quarantine was established in the 1850s ending Texas cattle from passing through. Texas had beef. The Midwest had stockyards and railroads. Despite their best efforts, cowboys could not convince the cattle to fly. Then in 1867 an enterprising young guy from Chicago bought a few hundred acres of land in north central Kansas, built a hotel and pens, and convinced the Kansas Pacific to build a siding and loading area. Joseph McCoy then put out the word to Texas ranchers - they could now drive their Longhorns up the Chisholm Trail, west of the quarantined area, where they would be shipped by rail to the markets in the East. For ranchers and cowboys and horse wranglers, blacksmiths and barrel coopers and wagon makers, saloon proprietors and cooks and whores - suddenly, things were looking up. And Waco found itself sitting fat and sassy right on top of the Chisholm Trail with a respectably sized, somewhat mercurial river that needed to be forded by untold numbers of Longhorns. Wacoians had a collective a-ha moment. What Waco needed ... was a toll bridge. And so on New Year's Day in 1870, the Waco Suspension Bridge opened and collected its first toll. Stagecoaches, wagons, pedestrians - all paid a toll to cross. For cattle, the fare was a nickel. That amounted to a respectable percentage ranchers were paying to get each animal up to the new Kansas Pacific siding in Abilene - between 12 and 15 percent of the total cost each - but the low incident rate of drowning while crossing a bridge compared to swimming across appeared a prudent investment. When McCoy left Chicago in 1867, he boasted that he would bring 200,000 head of Longhorn through Abilene in 10 years. Instead, he moved ten times that number, two million, in only 4 years. It's rumored that this accomplishment gave birth to the phrase "the real McCoy". In 17 years, more than 5 million head of cattle and 1 million horses were driven up the Chisholm Trail to market. The Trail had many feeder routes that branched out like the roots of a tree, so how many of those animals crossed the Brazos via the Waco Suspension Bridge is unknown. Records show, however, that the $141,000 cost of building the bridge was recouped within the first year. In 1889, the bridge was purchased by the county and the tolls were removed. By then, Texas's cotton industry had recovered from the Civil War to lead the US in production and sugar production was multiplying due to recent agricultural and production advancements brought in from the Caribbean - and the vast majority of all that crossed this beautiful bridge.